The fourth unforgettable historical love story set in Italy from Marina Fiorato, author of the bestseller THE GLASSBLOWER OF MURANO. For fans of Philippa Gregory, Sarah Dunant and Alison Weir. The Palio: Siena's famously dangerous and hard-fought horse race. A year of planning, ten riders, three circuits of the piazza - and all over in a single moment. But this year, for two of the women watching, far more than the coveted prize is at stake. 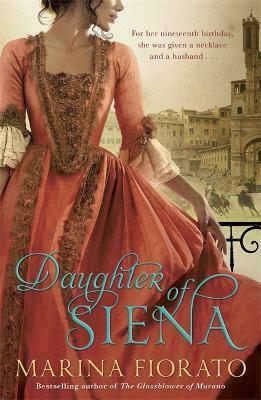 For Pia of the Tolomei, the most beautiful woman in Siena, the Palio is her last hope of escaping a violent marriage. For Violante de Medici, it marks the start of what her enemies intend to be her last month as governess of the city. Isolated in her palace, surrounded by conspirators, she must find the courage to uncover a plot that threatens her very existence. The trumpets sound. And into the piazza rides an unknown horseman, clad in the colours of the Tower contrada. What he does during the race will not only change the lives of Pia and Violante, but alter the course of the Medici dynasty itself. Marina Fiorato is half-Venetian. She was born in Manchester and raised in the Yorkshire Dales. She is a history graduate of Oxford University and the University of Venice, where she specialized in the study of Shakespeare's plays as an historical source. After university she studied art and since worked as an illustrator, actress and film reviewer. Marina was married on the Grand Canal and lives in north London with her husband, son and daughter. She is the author of five novels: The Glassblower of Murano, The Madonna of the Almonds, The Botticelli Secret, Daughter of Siena and The Venetian Contract. You can follow Marina on Twitter at @MarinaFiorato and find out more about her and her writing at www.marinafiorato.com.